The Hazard Impact Framework provides us with a common and consistent approach to modelling and forecasting natural hazard impacts. Specifically, the Hazard Impact Framework is a source of definitions and common concepts in impact modelling. It provides standard guidelines and, where necessary, stricter protocols for developing Hazard Impact Models. Why do we need the Hazard Impact Framework? Scientists, technicians and project managers engaged in model development are provided with a clear workflow and extensive advice. Technicians building or maintaining systems using hazard impact model outputs are provided with consistent, standards-based interfaces by all models developed under the Framework. Expert users who produce warnings based on their interpretation of model outputs are provided with consistent impact and/or risk information relating to one or more hazards. It will therefore be easier for these users to prepare relevant and consistent advice and visual aids explaining complex multi-hazard incidents. Responders and decision-makers taking advice from multiple expert users are assured that this advice uses the same baseline assumptions and understandings. This helps to align different types of information with appropriate response decisions. Researchers undertaking long-term risk analysis have access to an open and transparent methodology for incorporating impact into their models. 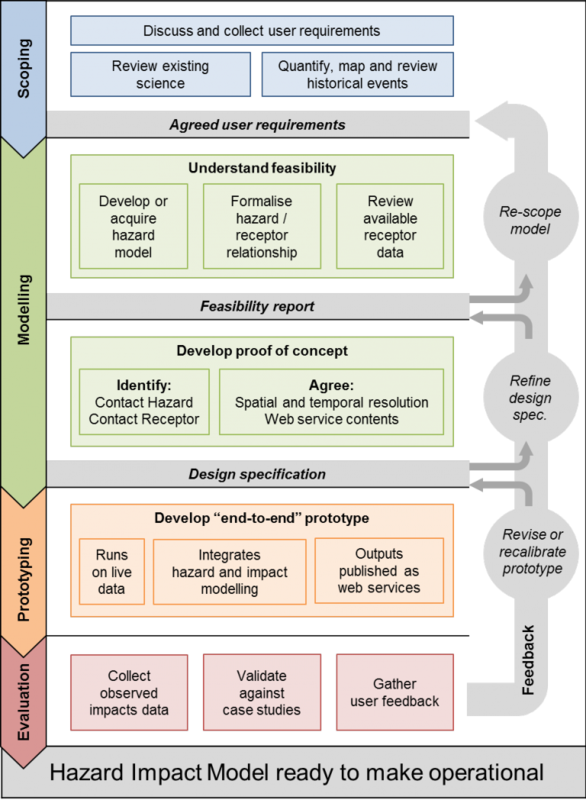 The Hazard Impact Framework provides developers with a workflow consisting of four key phases (Scoping, Modelling, Prototyping and Evaluation). There are goals and activities for each phase. Breakpoints are identified to review progress. Allowance is made for return to an earlier phase if necessary. On completion of this workflow, the model is ready to be made operational. How can the Hazard Impact Framework help with multi-hazard warnings? Hazards can occur together - for example, Heavy rainfall, Lightning and High Winds are common in storm events. Or one hazard may trigger another hazard - for example, Surface Water Flooding can increase the likelihood of Landslides. At the moment, the science is not yet developed enough to conduct this sort of analysis over such a large array of hazards. The first step is therefore to find methods of either standardising model methods, or standardising model outputs. We have developed the Hazard Impact Framework with this in mind. The Hazard Impact Framework is a working document - it will continually evolve with new evidence drawn from our experience and research, and our discussions with the wider scientific and resilience communities. The full Hazard Impact Framework report provides much more detail on the HIM workflow as well as outlining core concepts in impact modelling. The Hazard Impact Model factsheet accompanies the Hazard Impact Framework. The factsheet provides easy reference to the decisions that we made for each completed Hazard Impact Model so far with regards to the Framework.